Reverend Moon began his mission in the most difficult circumstances- in an impoverished country ravaged by two wars. Today he is the leader of a worldwide movement with activities 185 nations, the founder of organizations and institutions in nearly every area of human endeavor and the leader of a major interreligious peace movement. Find out about the life and lifestyle of the man behind these extraordinary accomplishments. 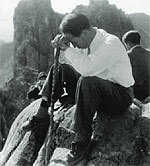 Born in Korea in 1920, Rev. 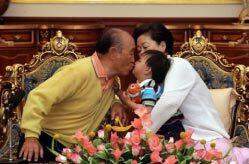 Moon’s early life was most affected by the enormous suffering he saw all around him as the son of a farm family in a time when Korea was poor and harshly exploited by a foreign power. His first question was “Why is there so much human suffering…?" His Daily Life: For all those who personally observe Reverend Moon, the most astounding thing is his life of living for others. Read the only full interview Reverend Moon has ever given. Conducted by Dr. Frederick Sontag, scholar of philosophy and author of the book Sun Myung Moon and the Unification Church- An In-Depth Investigation of the Man and the Movement. Crown of Glory - This heartfelt poem by Reverend Moon as a youth about loving others when it is difficult shows Reverend Moon's unchanging character. Reverend Moon shares his love of the ocean with a grandchild. 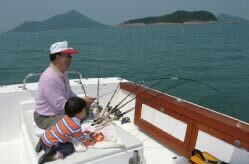 He finds the ocean one of the best places for meditation and prayer and is an avid sportsfisherman. 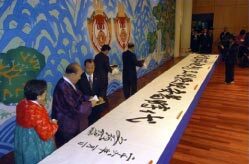 Reverend Moon, who excells at oriental calligraphy, paints a commemorative banner to celebrate a special occasion. Watch an Internet TV program in which Ambassadors for Peace of the Universal Peace Federation speak about their efforts to resolve some of the most challenging barriers to peace. Reverend Moon's 1951 "headquarters"- a shack he built from discarded US military ration boxes as a Korean war refugee in Pusan, South Korea. 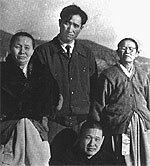 Reverend Moon with some of his first followers in South Korea during the Korean War. The effects of nearly three years in a Communist labor camp are still etched on his face. 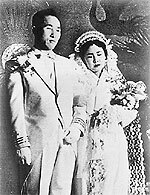 Reverend Moon was married to Hak Ja Han in 1960.Today they have 14 children and more than 40 grandchildren. Prayer and meditation are a major part of Reverend Moon's life.